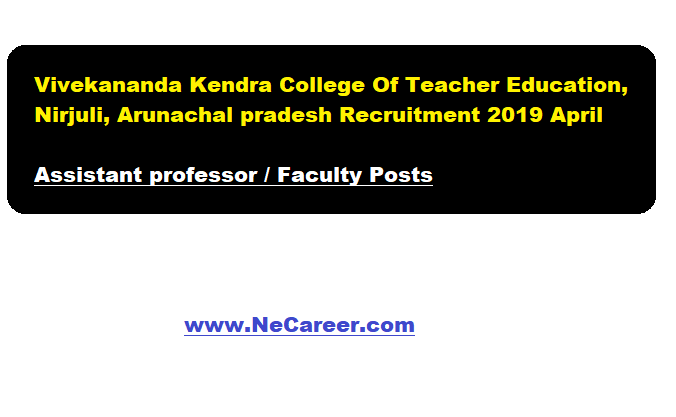 Vivekananda Kendra College Of Teacher Education, Nirjuli Aruncha Pradesh Jobs 2019 April - Faculty Posts:- Welcome to North East India's No. 1 Job Portal NeCareer.com . In this post we are going to mention about a new Job in Arunchal Pradesh. Vivekananda Kendra College of Teacher Education, Nirjuli, which is Under Vivekananda Kendra Vidyalaya Arunachal Pradesh Trust, Affiliated to Rajiv Gandhi University invites Applications from UGC,NCTE and RGU norms qualified candidates with a flair for teaching and high sense of dedication. Candidates must have Post Graduate degree in concerned subjects with M.Ed. with minimum 55% marks (Both post Graduate and M.Ed level) .Candidates with P.Hd ,NET/SLET and knowledge of Computer Application are desirable. Pay: Salary Allowances, and Perks as per Trust Norms. Selected candidates Will be provided Single Bachelor accommodation on secured campus with amenities . The last date for receipt of online application is 10 days from the date Of advertisement.Only shortlisted candidates are contacted for an interview.